The ER 1300/1600 combined-line machines combine innovation and optimized design. They have a steering wheel for exceptional maneuverability. They also benefit from the largest cylinder block with double cylindrical brushes on the market for this type of machine. The ER 1300/1600 combined-line machines combine innovation and optimized design. They have a steering wheel for exceptional maneuverability. They also benefit from the largest cylinder block with double cylindrical brushes on the market for this type of machine. These inverted rotation cylindrical brushes allow perfect cleaning (washing and sweeping) in a single pass. The ER 1300 and 1600 are available in all types of thermal energy (diesel, LPG and gasoline) to meet all needs. With a working width of up to 157 cm and a large tank capacity of 380 liters, everything is there to achieve one of the most productive materials of the moment with a yield of up to 13900 m2 / hour. 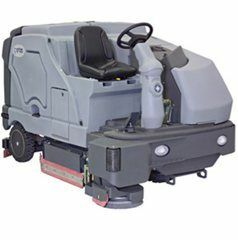 The ER1300/1600 ride-on combination machines are the definition of innovative and optimized design. This manoeuverable front steer is the widest cylindrical scrub deck in its class. This deck’s dual counter-rotating cylindrical brushes are capable of sweeping and scrubbing in one single pass.